As you can see, I transferred pieces of the interior of an approximately 85g PF Classic. Work was done inside a freshly cleaned SAB, and all tissue was dipped for about 30 seconds in 3% Peroxide. The grain jars both look clean, and have jumped off nicely. I am confident they will turn out well. On 1 of the plates, there is what looks like almost bubbles, but I haven't noticed much growth of them. A transfer or 2 is going to be needed for that plate. The other looks completely clean. Any recommendations on what to do with the plates? I'm new to agar completely. 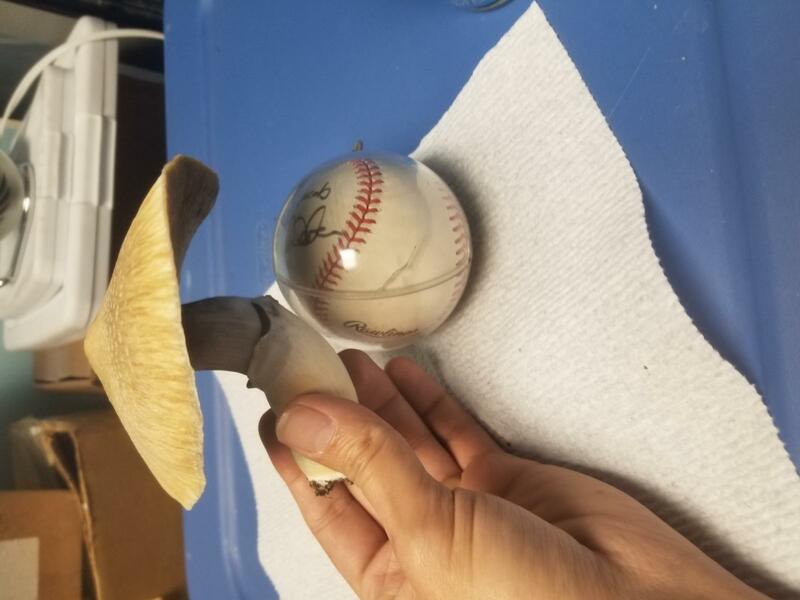 Do I have to let the plate completely expand before a transfer? 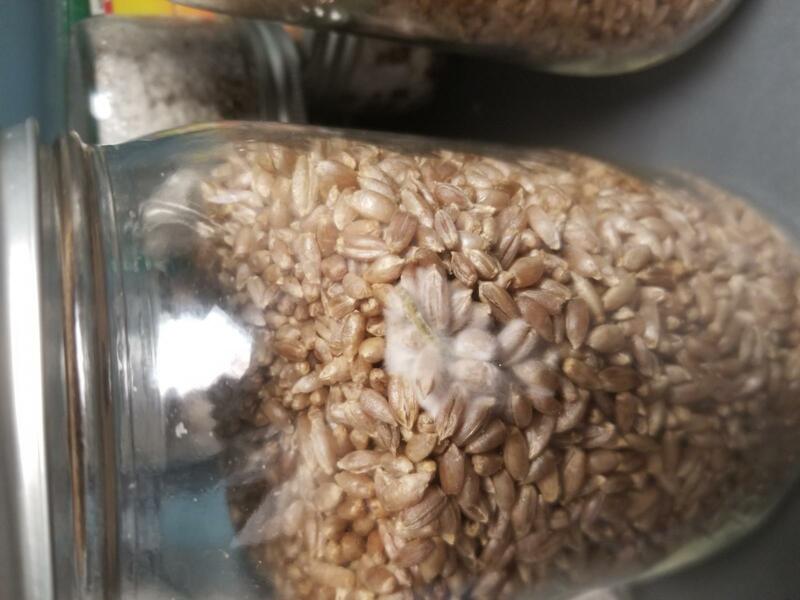 Can I try transferring straight to grain from the clean plate? If so, how big of a piece has to be used? You'll want to use agar where the surface is completely colonized. You can transfer from colonized sections without the whole plate needing to be colonized. Normally - I'll put two to three square centimeters of colonized agar into a jar of sterile grain. If you cut the transfer into smaller pieces, you'll have more inoculation points from which the mycelium can run. You're correct. From your photo line-up........the plate on the left is clean. 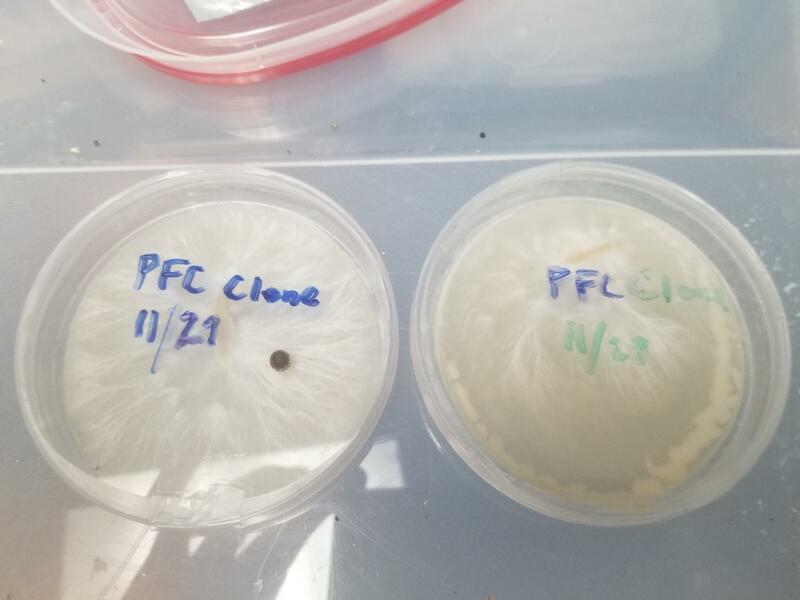 The plate on the right has a contaminant at the edge. This is no problem. 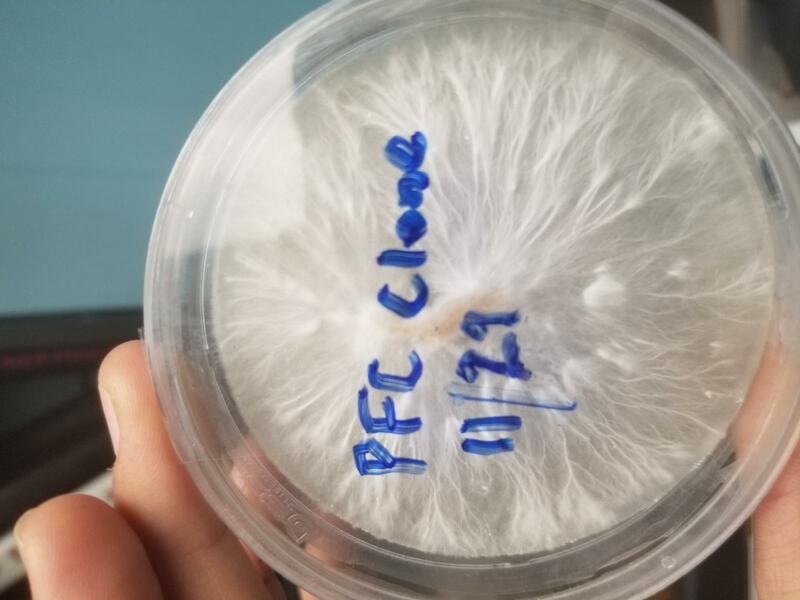 Simply transfer clean mycelium to a fresh plate. If this is really your first time with agar........I'm impressed. 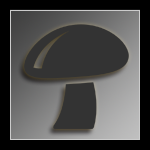 You've completed a pretty "complex" task as far as mycology goes. Edited by Myc, 10 December 2018 - 03:10 PM. Thank you, that mean alot! When I do something new I wait until I think I know what I'm doing back and forth as they say. And all my successes are due to everyone's help. One last question, which seems kinda obvious, but can I shake these jars when they reach 15 or 20%? Or is leaving them alone a better idea? If I get even 5 or 6 of these per flush I'll be so happy. I can imagine a canopy of these. Nice choice of specimen! Looks healthy. Treat agar transfers just as you would spore solution or liquid culture. You're correct. Shake the jars @ 20% colonization. 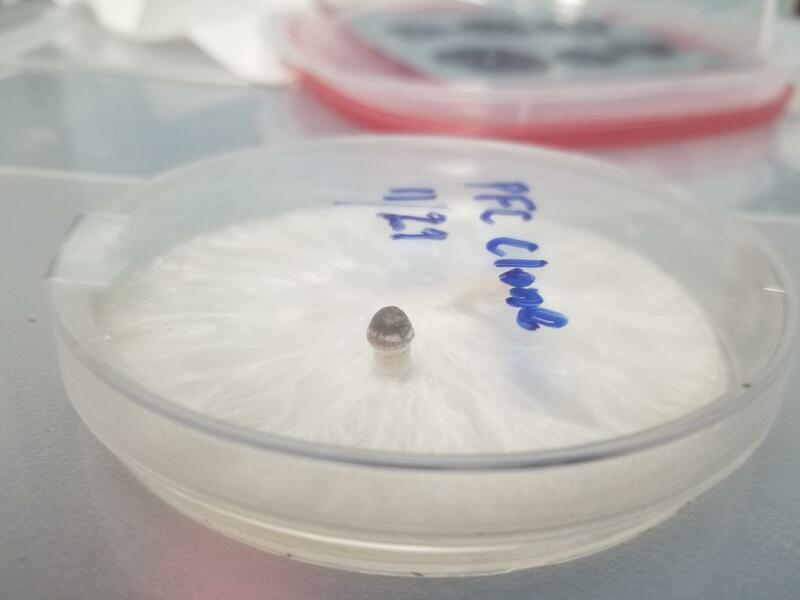 When using live tissue, colonization will happen quite rapidly. Much faster than spore solution. It's really nice to see someone take to this hobby with such apparent ease and expertise. This is the whole point of Mycotopia!! Thank you so much! It is a huge relief to hear I'm on the right path. I have so many projects going on I have been terrified I missed important steps in the one I have no experience with. I know everyone here is here to help, so that make things easier. Edited by Deleena24, 30 December 2018 - 03:55 PM. Anyway it was basically saying half the grain is going to a mini dubtub so I can get a bunch of sterile prints for the community. The other half will be split between two of my hpoo invitro grows. I'd use all the spawn like this, but it's just easier to get prints when you can simply remove the top of the FC. So that decision came down to pleasing all of you guys in the community. I also have no idea what to do with the plate, and it's starting to produce knots. Is there only 1 substrain on there? Do I need to do more transfers? Do I pick certain spots or not since it's a clone? Can I go straight to grain? I'm lost, and directions on what you would do would be really appreciated. I'd make more plates, but I like redundant back ups. Hard to say for sure, no distinct sectoring, but I'd probably pull from the 12 o clock to 4 o clock section. Once I had new plates growing I might take the rest to grain. The spot mention might make me hesitate though. I've got so much grain all ready to go I'm willing to try. Thx for the advice. 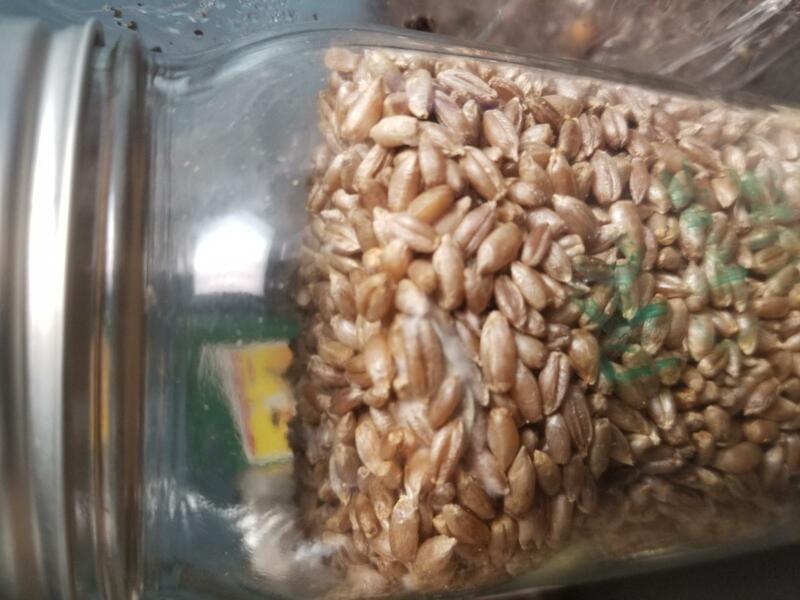 The grain jars are perfectly healthy and 100% colonized. Here are the plates. I'm thinking about tossing the 1 that's not clean. PM me if you have a better idea what to do with it. The pin on the plate is an exact miniature of the one I cloned. Can't wait to spawn to bulk. Nice. I just noticed this thread. What did you do to noc the grain jars? 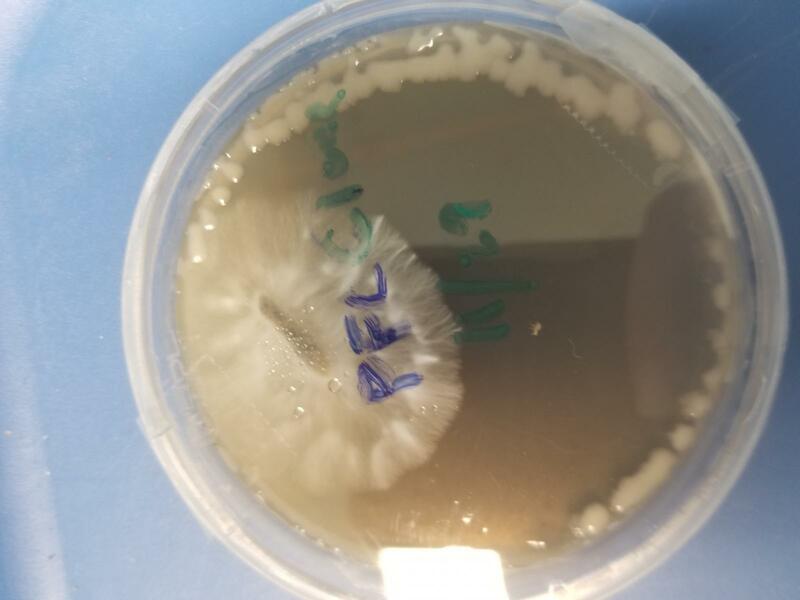 Piece of agar? 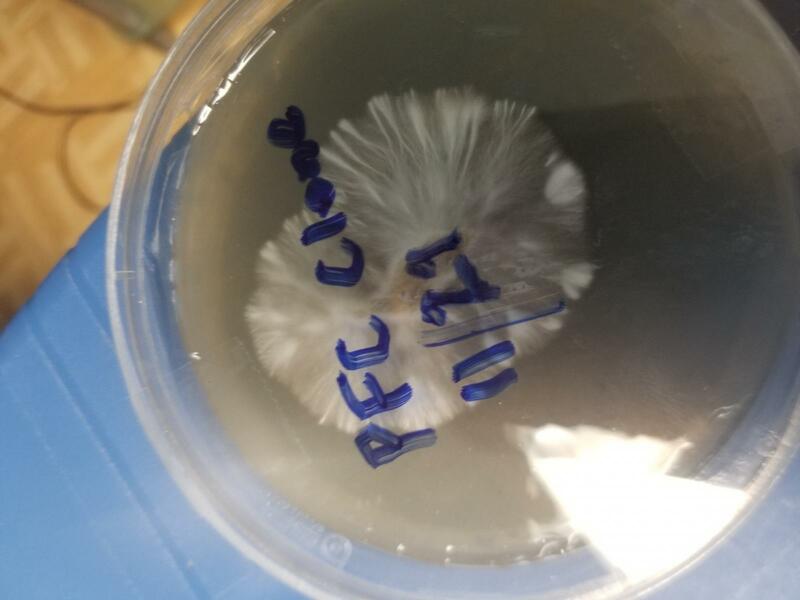 I presume that if you are cloning a fruit then, since it's all mono clone you can sample as much myc / agar as you like to transfer as long as it looks clean. Would probably make a nice LC. Just thought of something. Could one blenderize some sterile internal stipe tissue into an LC? If that works (wow!) should be an excellent source of known sterile material for LC. If nobody has tried it maybe I'll give it a go. Seems half my LCs are contaminated even though they often come from beautiful plates. There must be some occult yeast, bacteria or foreign mold or spores. I love a potent LC but it's such a disappointment to create it, incubate, noc some jars and end up with badness. Sorry, I digress. Just imagining the idea of a sterile myc source for LC if a blended fruit would work. For the grain I simply put a piece of sterile tissue from the inside of the stem. 1 jar I soaked the piece of tissue in peroxide for 30 seconds before putting it in a jar of sterile rye berries. The other piece wasnt dunked in peroxide at all. Both colonized at the same rate. All work was done inside a SAB. There are thread where people did the same to create LCs. There is also the coring method. Basically you put the syringe needle through a clean piece of stem and you're left with a nice little "core" of sterile tissue inside the needle. You then inject into LC through the SHIP, and there ya have it. Tissue direct to grain. Nice idea. Wonder if you could take a big chunk, blenderize it then go to immediately grain to speed it up? 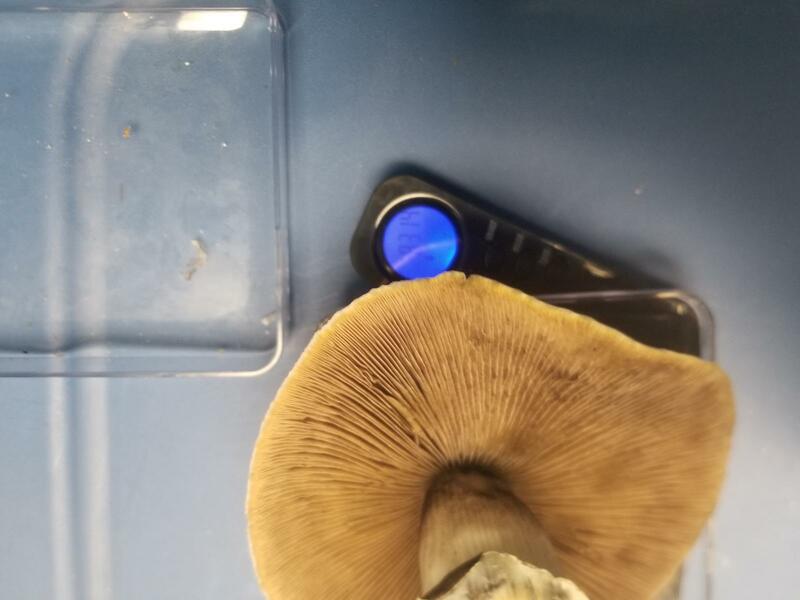 Sort of an LC without nutrient or incubation. And I guess the H2O2 was in order to kill any spores, of which there might be many on a stem? Yes, just did a search and found the coring method referenced here. Lots of comments but the author never comments as to whether it produced any spawn. 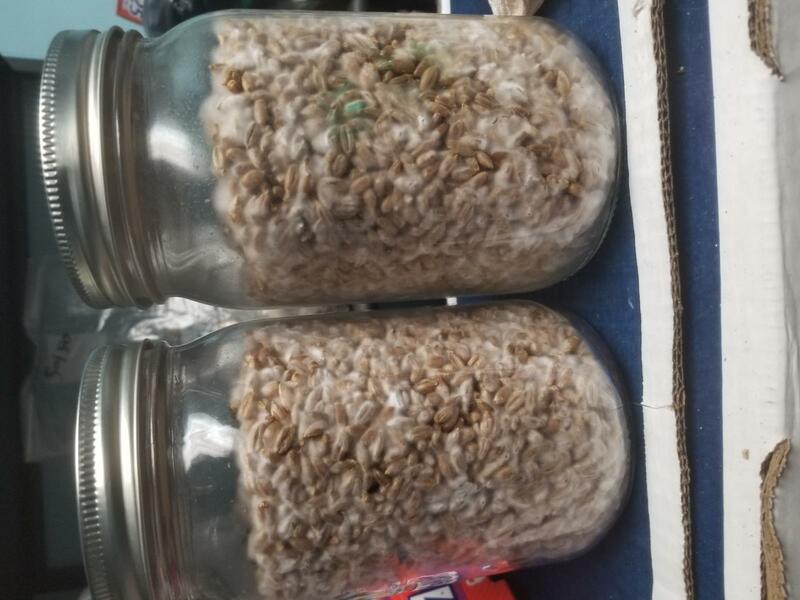 Yes, I have seen a thread of people blending up whole mushrooms with a bit of sterile water to make an innoculant, and it worked amazingly well. The water/mushroom sludge turned a brilliant blue, too. I'll try and find a link for ya.